Say goodbye to stuffing your winter coat, scarf, and gloves in some corner at a show- Spring finally graced us with her presence. Hopefully you were outside at some point, catching some sun, wearing (tastefully) very little. To mimic the weather, we’ve picked out some awesome music shows that are happening in Bushwick, Greenpoint and Williamsburg this weekend. Be prepared to get crazy like Ron Swanson above- you deserve it after a long, cold winter! 6. Sharkmuffin and Lunchbox join forces to play at Public Assembly this Thursday. Despite the heavy guitars and forceful drums, these bands both bring to the table, there's an aire of cuteness to this show. It's probably the fact that Tarra Thiessen (frontwoman of Sharkmuffin) and Matt Kramer (frontman of Lunchbox) are dating. Both bands encompass the loud, heartfelt meaning of punk. Four awesome bands come together to play under one roof, The Ho_se, for Jordan Michael's Book Release, 1000 Band Names. What had initially started as a memory book, turned into an extensive list of bands. A unique concept along with great music, this will be a cool show. Head to Big Snow this Saturday to see Bushwick favorites, Lodro, Heavens Gate, Hard Plastic Buttons, and Rob Karpay. John J. Rambo brings us an eclectic lineup that flows together perfectly. From garage to dream pop, you don't want to miss this. Little Skips brings the party to Bushwick featuring Sic Tic, Shadow Monster, and a few surprise guests. The show is FREE, so there's no excuse to miss it if you're in the neighborhood. Delorean makes their way from Spain to play a set at the popular Williamsburg venue, 285 Kent. These electronic dream-pop dudes will definitely pack the place with their playful, catchy songs. Three other sets accompany the quartet, ensuring a fun-filled night! BrainCave's Stellar Lineup. Designed by Abbey Ley. 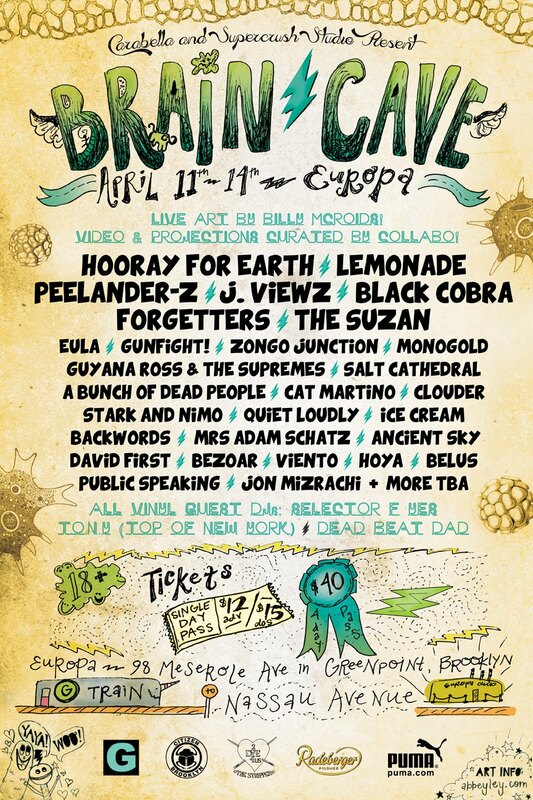 This weekend, Europa hosts the four-day music festival, Brain-Cave. Brain-Cave Festival, is curated by Cara Bella (Luis Velazquez) and Supercrush Studio. It began as a one-day DIY festival at Shea Stadium and has since evolved into four days of "multimedia bonanza." We wrote an article about it last week. You can check it out here. The festival features bands from Brooklyn to San Francisco. This is a go-to option for those looking to check out as many great artists as possible. Check out more music events in our Events Calendar, and add your own events to be featured in Bushwick Daily or get on our mailing list not to miss a single cool event in the area.